A Spectacular Classical Villa in its own walled gardens and grounds. An absolutely stunning 360 degree panoramic Tower View of the bay of Funchal. 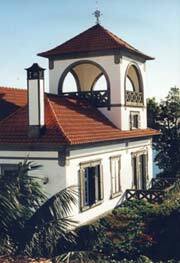 Some of the Finest Architectural Features to be found on any house in Madeira. In a popular high class residential area of Funchal. Extremely well situated on the edge of Funchal only 5 minutes by car to Palheiro Golf and walking distance to the old town. Maintained to a high standard and could be sold fully furnished if required. Beautiful Exotic Gardens and Ornate Terraces which benefit from late evening sun. Garaging and car space for up to 5 cars or more if required.